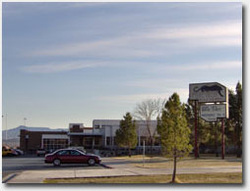 Pine View High School has 975 students and is a 3A school located in St. George, Utah and includes the areas of northeast Saint George, Middleton, Washington and Washington Fields. PVHS Choirs are rich with tradition and excellence. For over 20 years, PVHS Choirs have qualified for and participated in region and state choral festivals. Singers from the choirs participate in Utah All-State and Honor Choirs and regularly qualify for and participate in region and state Solo and Ensemble Festivals. PVHS Choirs regularly tour within and outside the state. The Choirs consistently achieve high ratings at such festivals as the Southern Utah Performing Arts Festival, Northern Arizona University Jazz / Madrigal Festival, the Green Valley High School Chamber Festival and other local and state events. Members of the choir participate in concerts and performances for Veteran's Day, Christmas, and Valentine's Day in addition to their Fall and Spring Concerts. In addition to the rigorous demands in the Fine Arts, students participate in extracurricular activities including the annual musical, sports and meet high academic standards. Most are involved in private music lessons and instruction. Concert Choir -- auditioned mixed voices choir. Meets as a class hour during the school day. Les Chanteurs -- easy auditioned women's choir. Meets as a class hour during the school day. Men's Choir -- easy auditioned men's choir. Meets during the lunch hour on Monday, Wednesday and Friday. Trilogy -- auditioned chamber choir. Meets before school (0 hour) at 7:00 a.m. every day. Students in Trilogy must be in one of the other auditioned choirs.